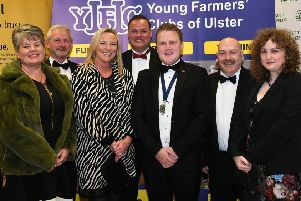 On Saturday, November 17th Co Down Young Farmers held their annual dinner and awards evening, at the Clandeboye Lodge Hotel. It is always good to look back and reflect on the successes of the clubs in the county over the past year. Guest speaker on the evening was YFCU deputy president, Mrs Zita McNaugher, with music by the talented band, Untouchables. A huge congratulations must go to all members who picked up a prize on the night at both county and Northern Ireland level. Co Down YFCU would like to thank the below list for their dedicated support and encouragement throughout the year. They have undoubtedly been fundamental in the county’s success and we trust that all members within Co Down will make a special effort to return their kind generosity. To sponsors, of the county magazine County Carry On, competitions and events. To judges, for their time and effort put in at competitions. To those who have offered use of facilities or equipment. A special thanks must also go to Farmview Dairies for their continued support with the Pinta Princess Competition which was awarded to Alana Dickson of Moneyrea YFC on the night. Co Down YFCU would like to thank the Clandeboye Lodge Hotel for the use of their facilities and for their excellent hospitality and warm and friendly welcome. Their co-operation really helped the night go smoothly. On the night the following awards were presented. Next up within the Co Down Young Farmers is an event to be held on January 19th 2019 in the Crown Plaza, Shaw’s Bridge. More information to follow, check out the Co Down YFC Facebook page for regular updates.